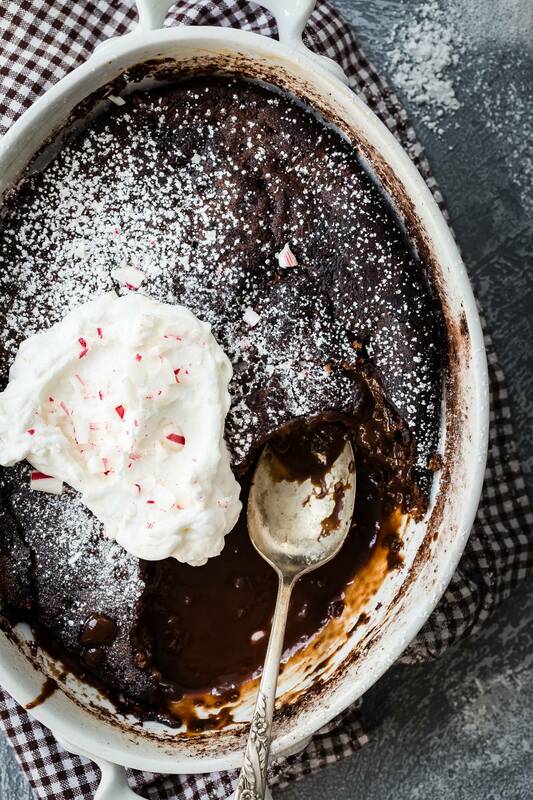 With the holidays coming up, you might want to make this Chocolate Peppermint dessert. It even makes its own chocolate sauce on the bottom! This post is sponsored by Pyure Organic Stevia Sweetener. I’d be lying if I said I didn’t bake a lot. And now with Thanksgiving and Christmas coming at me, my oven has never been busier! 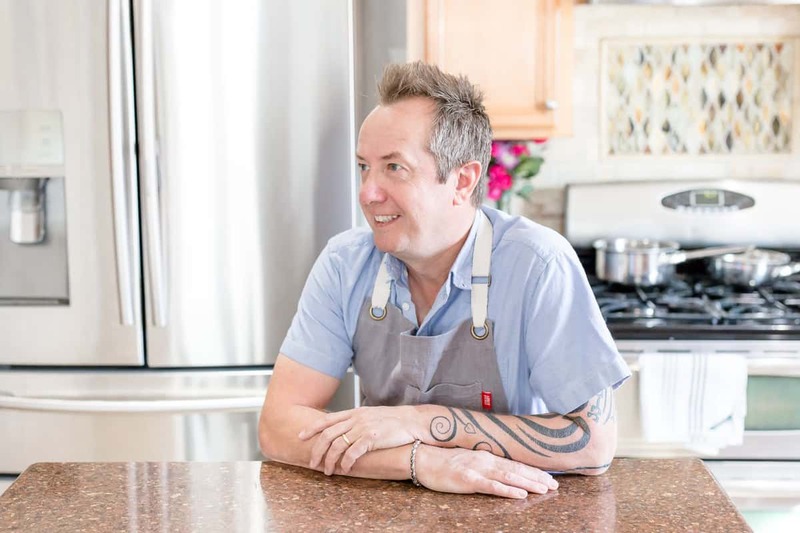 That means I always need to have the baking basics in the kitchen so plenty of flour, butter, eggs, and sugar. If you have these four ingredients, then you can probably be well on your way to baking something. But let me show you an awesome alternative to the last one I mentioned-sugar! 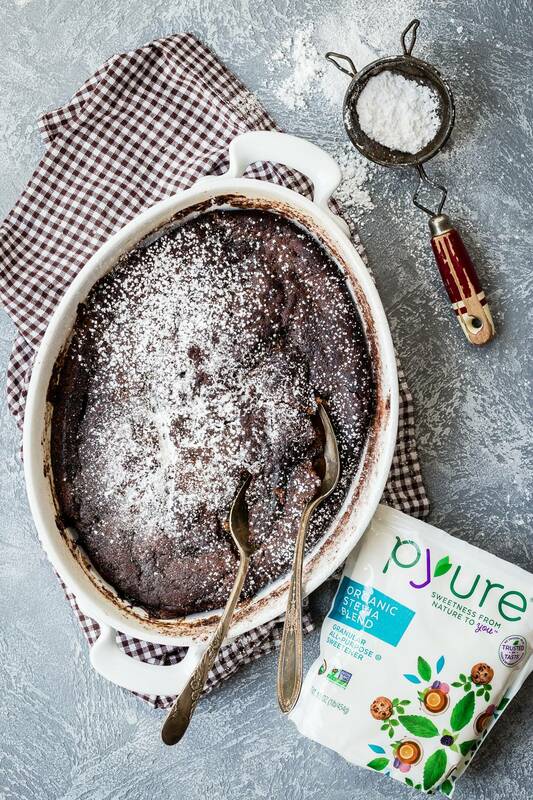 Pyure sugar substitute is made from stevia, has zero calories, completely natural and it’s 100% organic! 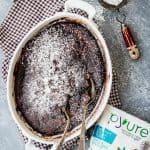 Usually, I stay away from alternative sweeteners just because I haven’t found one that hasn’t left a strange aftertaste in my mouth, but I was super impressed with Pyure because they only harvest the sweetest part of the stevia leaf. It was easy to work with and includes a handy guide on the package explaining the ratio difference to regular sugar. Most importantly, I didn’t get any aftertaste at all! Watch out for their new sugar-free maple syrup and sugar-free honey too. So I went ahead and did what any good baker would do and made this gooey chocolate peppermint cake. 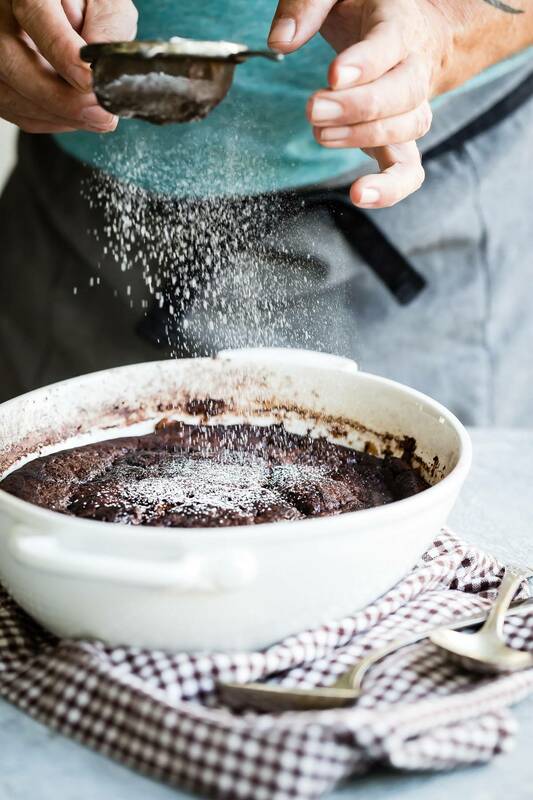 The process is a little different just because the batter is spread out evenly in the baking dish and then topped with a thick layer of Pyure and cocoa powder. Finally, hot water is poured over the mixture and baked in the oven. The batter from the bottom seems to rise up switching places with the water. The final result, a brownie-like surface with an awesome rich chocolate sauce on the bottom. I also added some peppermint extract to my mixture just because peppermint is huge at Christmas and goes really well with chocolate. Serve it warm by the scoop with a huge dollop of whipped cream and crushed candy canes! A delicious and gooey chocolate peppermint dessert served with whipped cream and crushed candy canes! Preheat the oven to 350 degrees F and butter a 9 inch square baking pan. Melt the chocolate either in the microwave or on a double boiler and set aside. Using a stand mixer, cream the butter and 1/2 cup of the Pyure Organic Sweetener until light. Add the flour, baking powder and salt to another bowl and mix together. Fold in the melted chocolate and spread out evenly in your prepared baking pan. 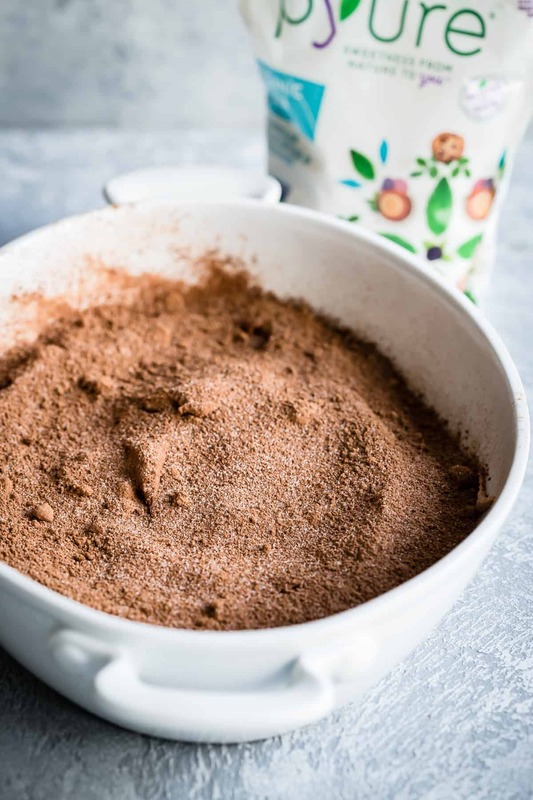 In the same bowl as you melted the chocolate, combine the remaining Pyure with the cocoa powder. Sprinkle over the cake batter and then slowly add the hot water to the pan. Transfer to the oven and bake for around 1 hour or until the surface seems firm but the rest of the cake will still be a little jiggly. The cake will set up as it cools. Serve with freshly whipped cream and crushed candy canes on top. Ooh, such a great dessert for the holidays! Oh i’m so trying that stevia blend! perfect for a busy baking oven. agreed! What a perfect holiday dessert! I just got SO excited about peppermint season!! CHOCOLATE AND PEPPERMINT IS MY FAVORITE EVER! Anything chocolate-peppermint has my name all over it. This is holiday perfection! What a fabulous dessert! And I need to check out Pyure—as my tolerance for carbs has plummeted! Such a perfect flavor combo! This is to die for! Love chocolate peppermint anything and there is no exception here. Oh that gooey chocolate sauce! I love anything chocolate and peppermint, and this is amazing!